A LOW-COST flow calorimeter which characterises enzymes in just a few minutes, using samples measured in microlitres, is now available from TTP LabTech. 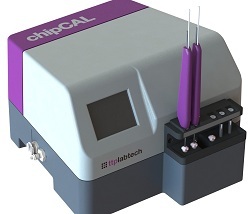 ChipCal takes only two to ten minutes to process samples, making high-throughput screening of enzymes a viable and affordable operation in any laboratory, the company says. Being shown in public for the first time this week at Pittcon 2012, being held in Orlando, Florida, ChipCal works on a novel flow principle. Enzyme and substrate are passed simultaneously through a thermodynamic cell, enabling calorimetric analysis of samples as small as 15ul and offering the additional benefit of non-contact, label-free sample monitoring. ChipCal has a working temperature range of 15-60C, allowing a variety of biological activities to be analysed. Following analysis, samples are transferred to a waste unit and a new sample loaded, without a time-consuming wash stage. TTP says that enzyme screening using this technology can significantly enhance high-throughput enzyme screening, analysing up to 60 samples in an eight-hour working day.